Summer pudding is a traditional British dessert made up of bread, soaked in the juice of summer berries. I’ve had the idea to make it into a smoothie flavour for a while now and the result is SO delicious! Don’t worry though – there is no bread in this smoothie. Instead, I’ve used oats and flaxseed to give that bread-y taste with the added nutritional benefits. So now I have the flavour of this classic summer dessert in the form of a delicious, healthy breakfast! It’s high in protein, omega 3 and fibre, making it the perfect start to the day. And not only does this smoothie taste good and is good for you but it looks good too! Look at the pretty colour… so vibrant and uplifting. So much summer berry goodness! 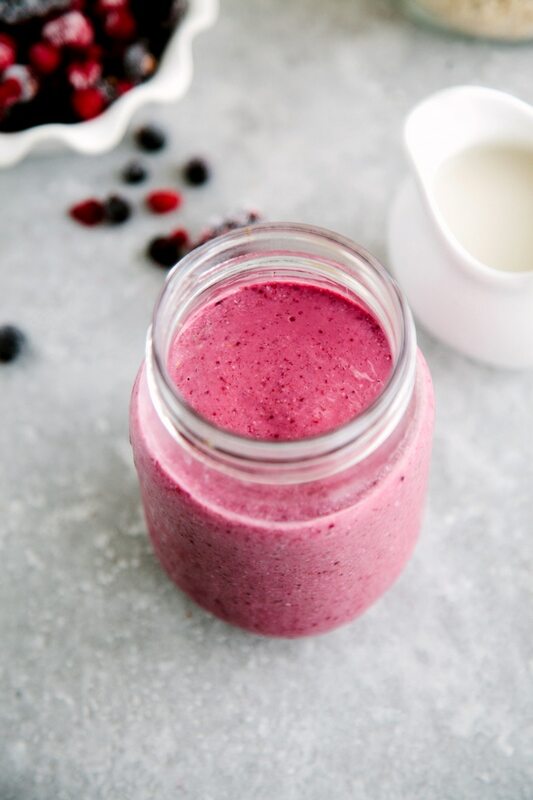 Summer pudding in smoothie form! This healthy breakfast tastes so good. 1 cup frozen summer fruits, mixed raspberries, blackberries, redcurrants etc. 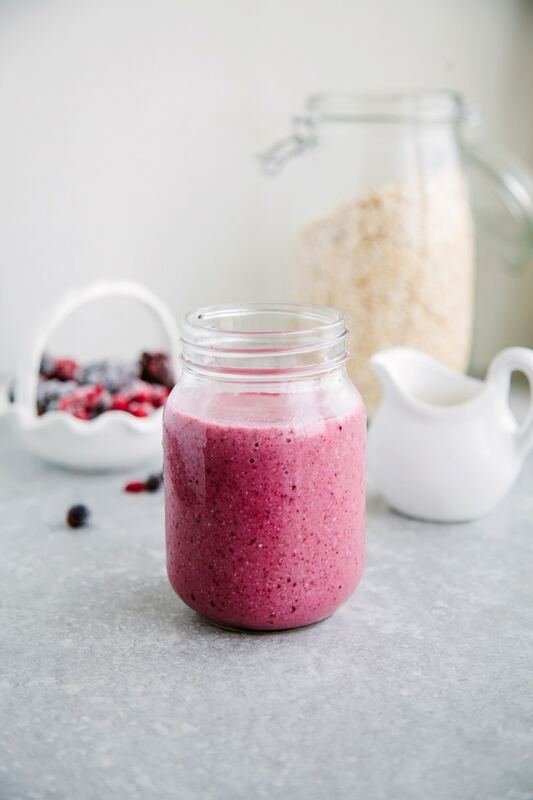 Simply add all the ingredients to a blender and mix until smooth, adding more almond milk if it's too thick. What dessert would you love to drink in smoothie-form? Summer anything is up my alley right now! And the color matches the season. Looks delicious! What a glorious coloured smoothie. Summer berries are wonderful used this way and make a pleasant change from green smoothies. I'm now wondering about what it might be like with the bread too!!! Haha! I just couldn't bring myself to add bread to a smoothie. 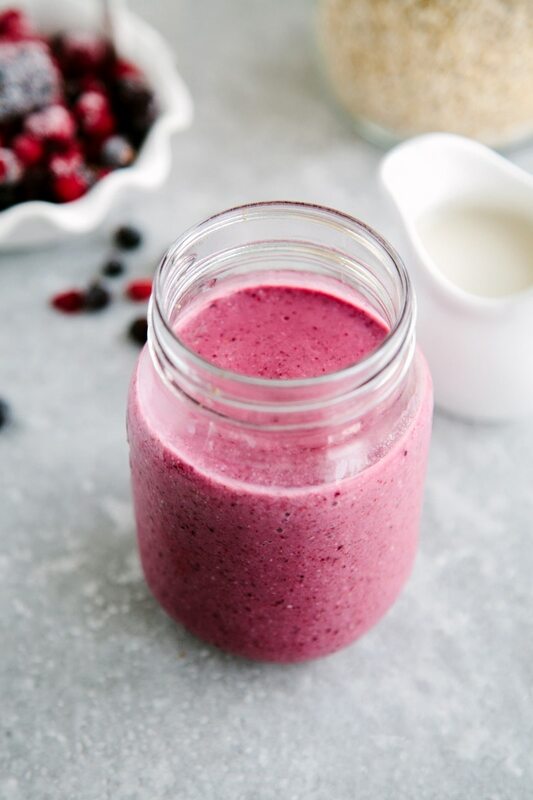 Berry smoothies are the best! Look at all the goodness in this smoothie! The name sounds like dessert, but the ingredients make for a full well-rounded breakfast! that's what I'm going for, thanks Alisa! The color of this smoothie instantly lifted my mood! It looks absolutely delicious! Love that it has oats and flaxseeds to give it the bread - like flavor! This looks sooo incredibly filling! What a lovely breakfast! Thanks Ceara :-) It actually is super filling, thanks to the oats! I grew up in Canada and loved the breakfast pudding as well. Maybe that's why I love throwing oats in my smoothies too, it reminds me of back home :). And your colors, so pretty and vibrant! That's my kind of smoothie right there! Thank you, Nicole! I agree - pudding-style breakfasts are the BEST. This is absolutely yummy. I used coconut milk because that's all I had and loved the added flavor. I also added a pinch of chai seeds just because! Thanks for your time with all of these recipes. Hi Rozi, thank you so much for letting me know you enjoyed this smoothie! And your addition of the chai flavour sounds AMAZING! To be honest, it's a pretty old-fashioned dessert - you don't see it an awful lot nowadays but it's still considered a classic :-) Thanks Nadia! 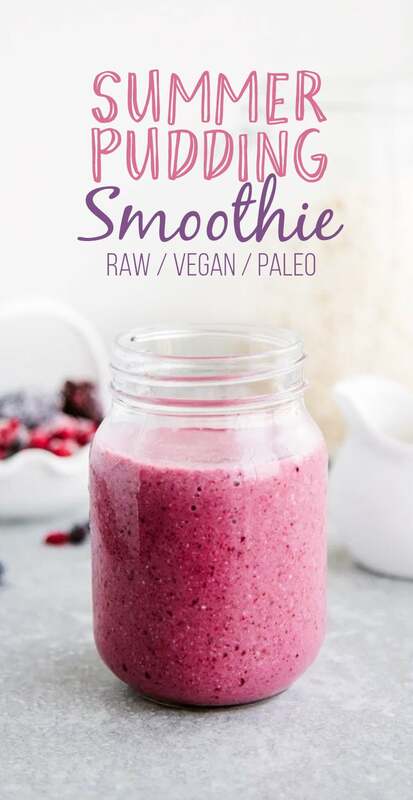 As much as I adore summer pudding, I was glad to hear there's no bread in this smoothie ;p It sounds so good, I really like the idea of adding oats and flax to it too. Oats and dates are SUCH Natalie ingredients! They just seem to work in everything, don't they? Oats are so underrated when it comes to protein! I love adding them to my smoothies :-) Thanks Linda! 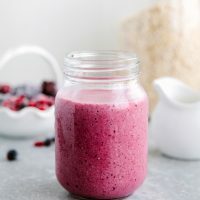 Oohhhh, summer pudding is one of my most favourite desserts ever... and yet I've never thought to make a smoothie version. You're a genius, Aimee! This looks delicious and so filling! So I've noticed, Kelly! I am loving all your berry recipes! I could stare at this all day long...it's so pretty!! 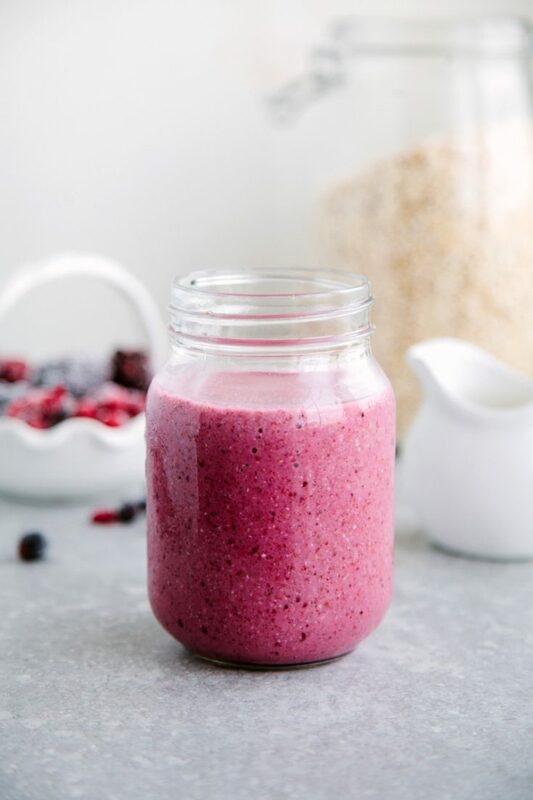 I love adding oats to my smoothies - makes them so thick and delicious. Need to try this! Thank you, Jenn! And yes, because I can't eat raw bananas, oats are perfect for giving that thick, creaminess instead. Love them! When smoothies are pretty colours, they somehow taste better!